I am not sure if this unit seen on Twitter not long ago is a prototype cabinet or not. It seems similar in some aspects. It seems doubtful that this would offer any sort of amusement-only option as some videmption games do but it will be interesting to see how this all pans out in the Redemptioncade space when you have more than one “Flappy” option to choose from. This one will has the license behind it while Adrenaline has a two-player option and a larger screen. I doubt we could see the market concurrently support more than two of these exact types of games although I will not be surprised if we see more at IAAPA in November. 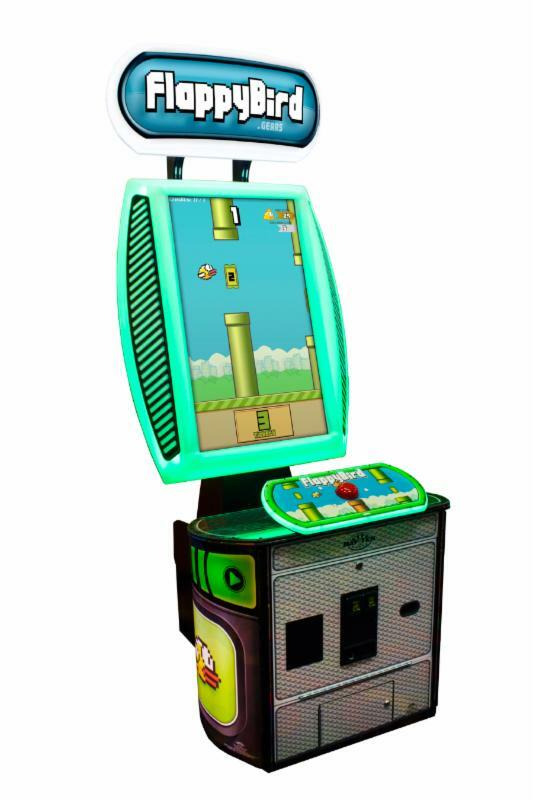 Flappy Bird Arcade will begin shipping in September. I still fail to see how they call these little kiddy caravel games “arcades”. I’d prefer it to be the real thing instead of further saturating the market with this junk. Sorry my view is so negative, but I want the type of gaming we used to take seriously back now more then ever. And as far as I’m concerned, everyone else would want the same. Not this. Wow. They really pushed that one out quickly! Wow,it seems that they’re pushing this “FlappyBird” license a lot further. And who needs 2 FlappyBird arcade games anyway?